Galloway Township Mayor and Council recognized the men and women of the Galloway Township Police Department and Ambulance Squad for two CPR saves, and their emergency response to the March 29th school bus accident. One of the CPR saves highlighted occurred March 10, 2012 when Officer Buckley, Officer Snuffer, Corporal Hendrickson along with EMT’s Leaming and Kane were dispatched to MeGettigan’s 19 Hole Tavern for an unconscious person. Upon arrival patrol found the victim in cardiac arrest. 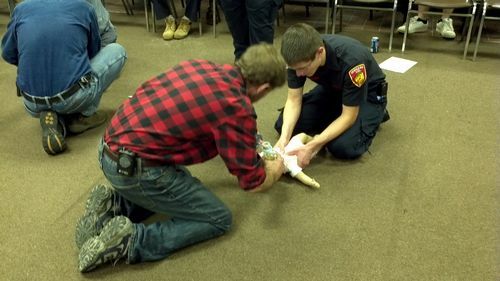 CPR was started and a automatic external defibrillator (AED) was attached and activated. Two months later the patient has fully recovered, returned to work and most importantly is spending time with her family and friends. 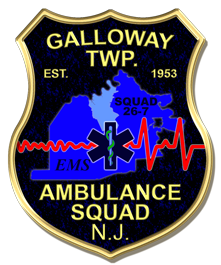 Charles Uhl Chief of the Galloway Township Ambulance Squad discussed the importance of the Galloway Police Department AED program. “Our Police Officers are often the first on scene, they provide appropriate medical care until EMS arrives. 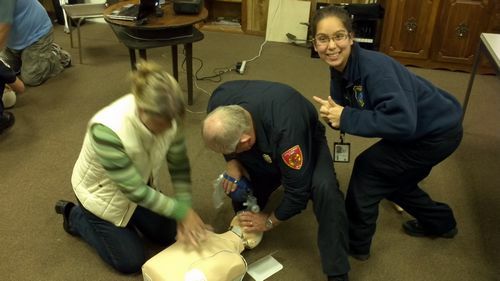 Seargent Joseph Picardi heads the AED program for the Galloway Township Police Department. 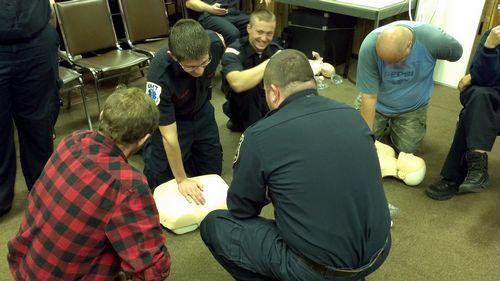 He reported that the police department began their AED program in 1995, making it among the first police agencies in the state to utilize these lifesaving devices. Every Officer in the Department is certified in CPR and use of the AED. Each officer assigned to a patrol area carries an AED in their patrol vehicle and is dispatched along with EMS to serious medical issues such as cardiac, respiratory, and trauma related emergencies. 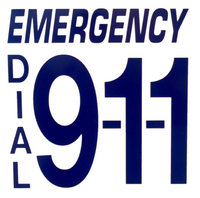 In addition AED’s are deployed with their supervisors, K-9 units, and SWAT personnel as well as officers assigned to special events such as Smithville Festivals and the LPGA. The Department currently has 10 AED’s, all of which are in need of replacement due to them reaching the end of their recommended service life. 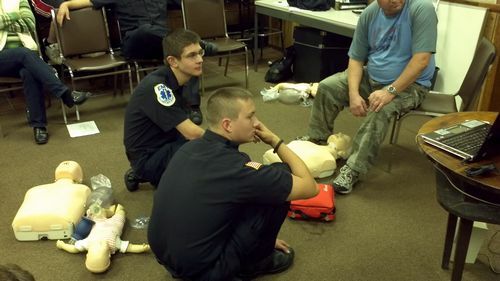 After learning that the AED’s were in need of replacement and knowing the importance of early defibrillation, the Ambulance Squad has started a campaign to raise the needed $12,500.00 to purchase the lifesaving devices. Chief Patrick Moran (Galloway Police Department) stated; “This project makes sense, it puts the tools in our Police Officers hands that can save lives”. Both the Ambulance Squad and police department look forward to working with, local businesses and members of our community in order to secure the necessary funds to continue to provide this lifesaving service”. 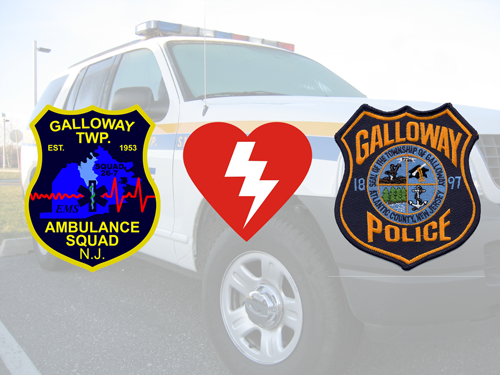 Anyone wishing to donate can drop off a donation at the Galloway Branch Cape Bank located next to the Police station at 320 E. Jimmie Leeds Road or mail their donation to the Galloway Police AED fund c/o the Galloway Township Ambulance Squad – PO Box 784 – Pomona NJ 08240. 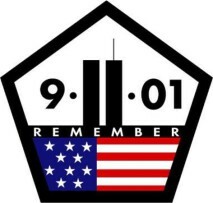 Click here to read the story from The Galloway Patch. 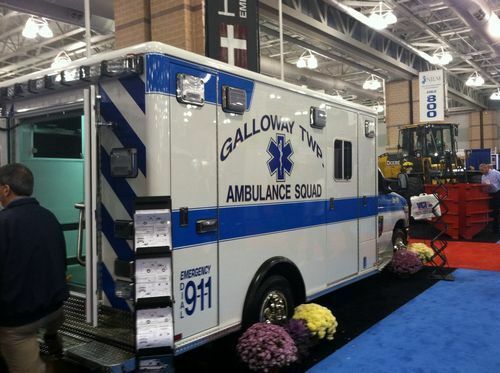 On April 21st 2012, the Galloway Township Ambulance Squad held their annual Training Day at Absegami High School. 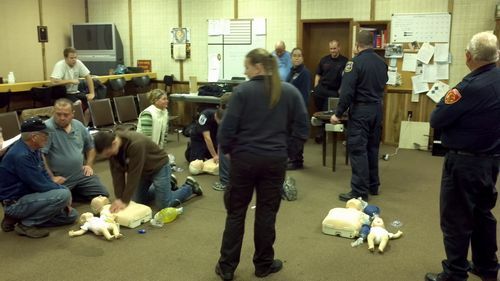 Training Day is a big event for the EMTs of GTAS. Hours of classroom based learning, a lengthy written test, several practical skills assessments and guest speakers from Cooper University Hospital are all part of the schedule. 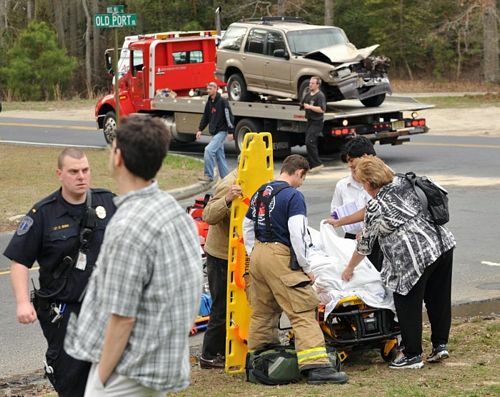 On the afternoon of March 30th at 3:37 p.m., GTAS responded to a report of a motor vehicle accident involving a school bus at the intersection of Moss Mill and Old Port Republic Road. GTAS responded and found two vehicles involved in the accident. The number of injuries required the activation of the Atlantic County EMS Task Force bringing in several ambulances from surrounding agencies, companies and townships. In total, 18 students and one adult were transported to area hospitals. Most injuries were minor but the driver of an SUV which struck the school bus was flown by helicopter to Cooper University Hospital. See the full story at The Press of Atlantic City. Acting Lieutenant Chris Snow on-scene. Photo by Michael Ein, Press of Atlantic City. 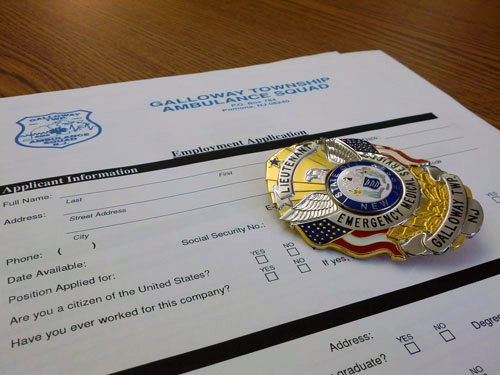 GTAS is looking for one motivated individual to assume the rank of Lieutenant. This position is open to both department staff and outside applicants alike. If you're motivated for success and driven to lead in a challenging and rewarding environment, please visit our employment page. For more information about the position, check out the official release. 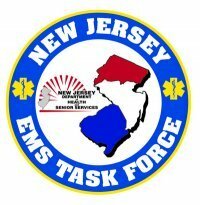 Applications for this position will be accepted until Friday March 2nd, 2012 at 5:00 p.m.
GTAS certifies the volunteers of Germania Volunteer Fire Company, part of the Galloway Township Fire Department, in the newest American Heart Association CPR protocols. Lt. Jim Jones, Lt. Stacey Rodenas, Acting Lt. Chris Snow and FTO Jamie Smith spent more than four hours of their time with the volunteers of the local fire company and gave valuable training which included an AHA video and materials, instructor-led demonstration and a written and practical skills test with actual tools of rescue including bag-valve masks and AED trainers. FF/EMT Burrows, a GVFC and GTAS member, and Jr. FF Rundio look on as Lt. Jones gives a presentation on the use of the Automated External Defibrilator (AED). FTO Smith pans over the students, looking for proper technique. Lt. Rodenas approves of how Galloway Township Fire Chief Ron Garbutt Jr. is doing. Lt. Jones puts the pressure on FF/EMT Burrows who is practicing single hand pediatric chest compressions. 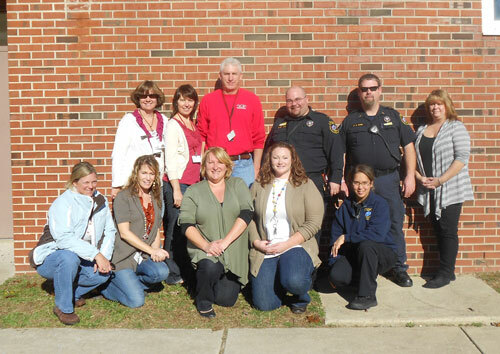 GTAS officers spent the day serving a Thanksgiving Dinner prepared by the special education students of Arthur Rann School for their families, teachers and school officials. 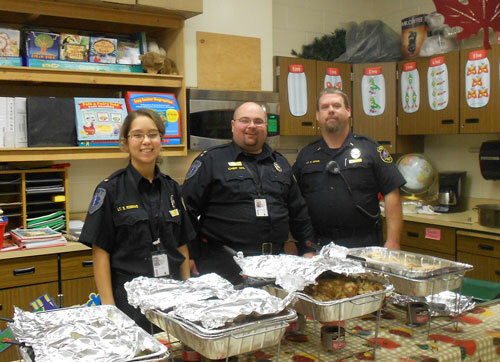 Lt. Rodenas, Chief Uhl and Lt. Adams serve Thanksgiving Dinner. The Cat Came To Work! 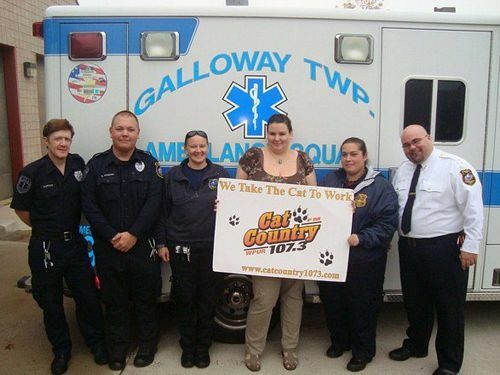 EMT Rhoads thought of her GTAS family when she applied for Cat Country 107.3's "Take The Cat To Work" contest. For her and her coworkers, EMT Rhoads won a catered meal and music all day at Station Two! Thanks EMT Rhoads! EMT Simpkins, EMT Pivnichny, EMT Smith, EMT Rhoads, EMT Freeman and Chief Uhl. 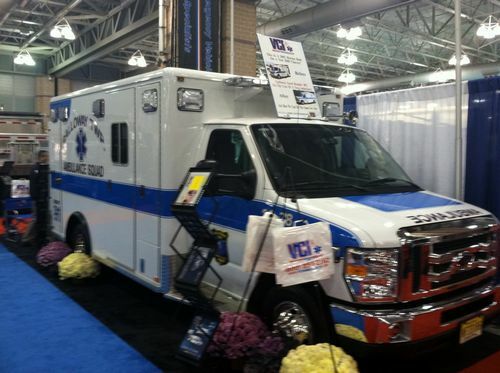 VCI shows off our new 26-78 at the New Jersey League of Municipalities. 26-78 was removed from service in June and sent to VCI to be remounted on a brand new Ford E-450 chasis. We got her back in November, a seemingly brand new ambulance. We're happy to have 26-78 back and ready to take calls.